Official opening hours of the exhibition are from 09:00-18:00 on both days. Innovation needs flexibility. In the IoT, this means to run your application and services easily on the plethora of IoT hardware that is currently available and to distribute your IoT application easily. We showcase RIOT, the friendly operating system for the IoT, and RAPstore, an app store for RIOT. RIOT powers the IoT like Linux powers the Internet. RIOT is a free, open source developed by an international grassroots community. RAPstore — An app store for IoT devices. The Internet of Things (IoT) is a game changer for the Internet. However, to be successful on the long-term, the IoT needs an ecosystem that enables easy and secure adaption of IoT devices to the needs of their consumers. A key enabler to achieve this goal is software. RAPstore is a project that designs and develops is an app store for low-end IoT devices. Similar to the mobile market, RAPstore aims for a platform that allows application developers to share software with end users, and to allow end users to update their IoT devices more easily compared to the current state of art. In contrast to the mobile market, these applications will run on many more devices with very constrained resources. We develop our solutions for the most modern operating system of the IoT, RIOT. Imagine Intelligent Materials was founded in 2014 in Sydney, Australia. The founders, from a background of materials science, signals processing and business, had a singular vision: to deliver infinitely scalable sensing systems using graphene enabling every part of the built environment to communicate. We believed then that the world needs more information to make informed decisions, and that we would be able to make building smart, roads smart, cars smart… and in so doing deliver massive productivity gains to our partners and customers. At the same time we believed that materials science has the capacity to solve many of the world’s biggest problems. We are well advanced on our mission. We built the first commercial graphene manufacturing plant in Australia. We pioneered the development of conductive coatings using graphene. We were to first to make leak detection geotextiles using graphene. We have established a vertically integrated business model. Our graphene coatings deliver sensing capabilities to materials without impacting the structural integrity of the substrate. Our prototype signal processing devices can extract useful data from the materials on stress, moisture and heat. We are now developing reference designs for these devices to enable them to be manufactured at scale. Knuper is a young startup specialized on the secure analysis of sensitive Big Data. Our approach is based on secure multi-party computation and federated learning. We enable an IoT environment where everything is possible – except sharing raw data. 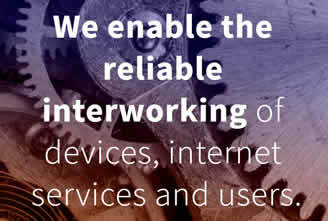 It’s the flexible universal operating system for data based services in the world of IoT. It’s made to create diverse services for smart home/building, energy/grids, smart city and even internal processes in an industrial environment. You are a creative developer or service provider, e.g. a telco, utility, insurance company, and it’s your goal to develop data driven services decoupled from specific hardware? That’s great. connctd supports exactly that. DIN – German Institute for Standardization e. V.
HyperCart – The next level customer experience in retail. The new shopping cart from HyperCart helps the customer to find and chose the right products and charges for them through object recognition on an Artificial Intelligence (AI) basis. The payment is done automatically when the customer leaves the store. HyperCart makes the customer happy and increases the shopping basket value through dynamic and individualized product recommendations. Increasing retail sales and reducing costs – HyperCart makes this possible. The revolution of mobile communication: About 75% of people are hesitant to contact other people they don’t know directly. Often they are using the Internet for the sake of a more easy and less direct access to get to know other people. In.Fi enables people to make first time contact with other people they do not know via smartphone without even the need to exchange contact data prior. 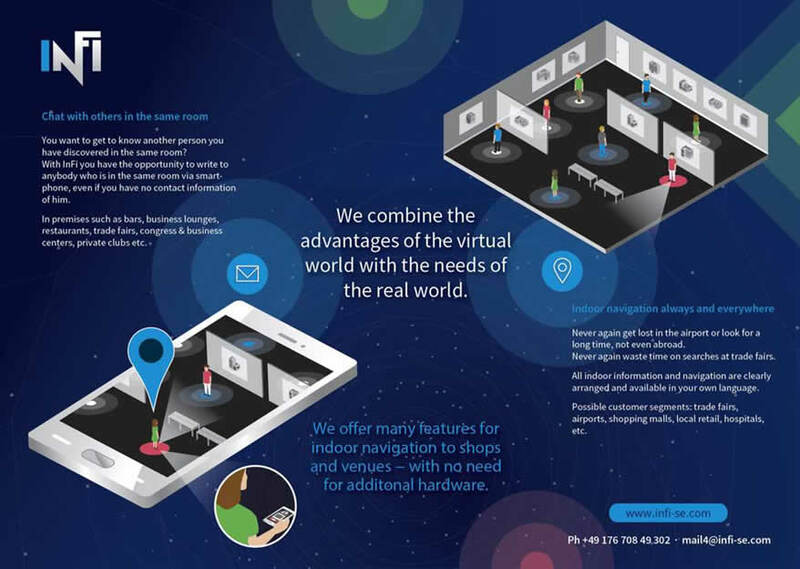 Indoor navigation always and everywhere. Never again get lost in the airport or look for a long time, not even abroad. Never again waste time on searches at trade fairs. Whether you’re looking for establishing new professional connections or in search for talents for your company, our recruiting & networking partner Talentese is there for you! 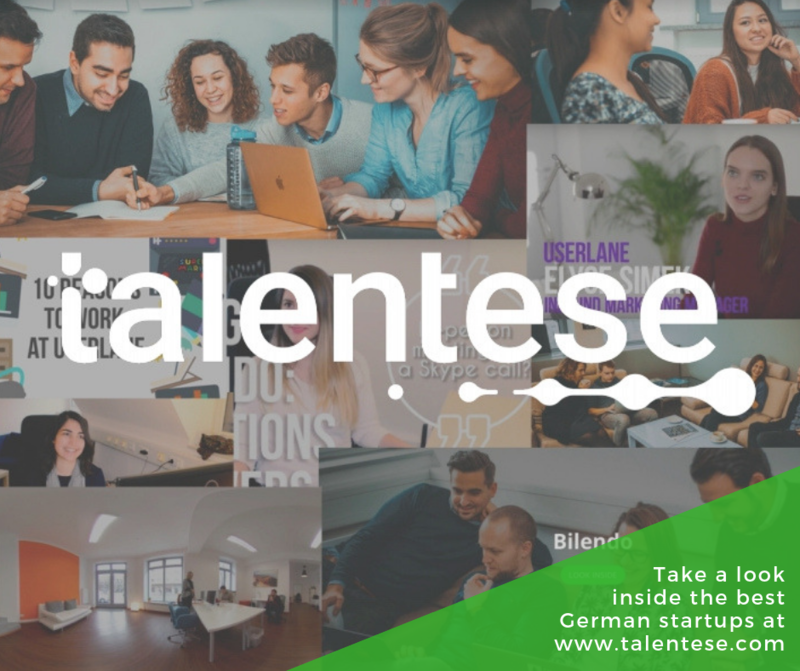 Talentese is a German job portal for startups ensuring the best match between companies and job seekers. Do you want your company to be presented at the event, too? Register your free profile at Talentese and make sure you’re visible to job seekers! Capital building for great companies. We create wealth through business acquisitions and sales, as well as sustainable financing of technology and manufacturing companies. 15 years in development, scaling, expansion, performance and exits of our own start-up and service companies make us your suitable consultant with sound knowledge, based on our own experience. Our consulting focus is on Central and Eastern Europe for technology, production and software companies only. We provide buyers and financing partners from Western and Northern Europe, North America, Asia and Israel. IBB is the business development bank of the Federal Land of Berlin. With its business support, it actively contributes towards developing Berlin as a hub for business and industry. Our staff working in housing and real estate promotion are the people to contact for all issues related to real-estate financing. IBB is a reliable, strong partner for Berlin and its business community. For us, ‘Working for Berlin’ means providing optimum support for Berlin-based businesses through tailored financing. IBB’s business development activities are geared primarily towards loan-based and investment-orientated forms of finance which are offered as revolving support funds. TOUCHING INNOVATIONS Mixed Reality Premium Partner | Join PANTHEA’s booth to deep dive into virtual realities. Get insights into AR/VR/MR and create new customer experiences to drive sales. Surtitling is the art of projecting translations above a stage during a theatre or opera performance, in synchronisation with the actors. Our team has been amongst the first to introduce surtitles for foreign visitors, notably in Berlin. 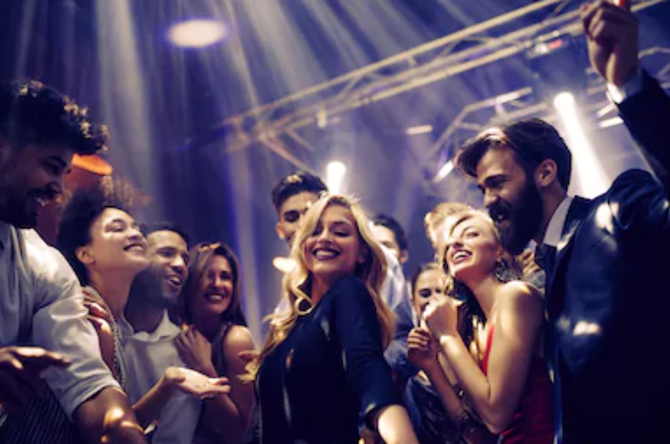 PANTHEA is made up of highly experienced teams in Paris, France, and Berlin, Germany, that have been active in surtitling for more than 15 years. PANTHEA is the European leader of surtitling solutions for performing arts. It is the only company that offers complete services in this field. In 2018, the company provided surtitles for over 2000 performances and welcomed guests of more than 60 nationalities. 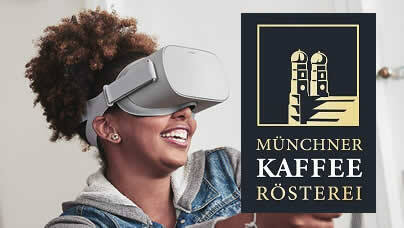 We use artificial intelligence, blockchain and virtual reality for the maximum coffee experience. With the help of VR, we take our guests to trade fairs and events directly to the coffee growing region to show them the current conditions. With the help of AI (image recognition), we can evaluate the quality of the coffee after it has been harvested in the coffee growing area. With Blockchain we eliminate corrupt quality managers in the growing areas and save up to 50% of the bureaucratic costs. The end consumer scans our coffee bag in the shop and sees in real time when the coffee has been packaged, roasted, shipped, harvested and grown. DO YOU NEED A DESK? Are you a freelancer, startup owner, entrepreneur and you’re looking for a place to work? Thanks to our app you can book a coworking space all around the world for an affordable price, tailored for your needs! Choose between 3 different price categories to find the best offer that suits your needs. DESK.WORKS is a mobile app that meets the needs of startups, freelancers and entrepreneurs – it lets you book a coworking space directly from your smartphone. It is the answer to the strongest office trend of our times: mobility. In the same time, workspace owners can offer their own desks for temporary or long-term rental to other users. You no longer need to spend time searching for offices on their way to travel the world as everything is never more than a few taps away! Sign up and find the perfect desk or register your coworking space and become the home of unicorns! Save Your Ticket. Seats are limited.